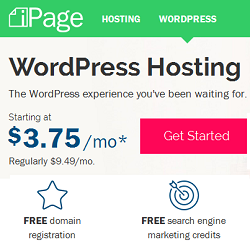 iPage WordPress Hosting curated the best possible features to optimize your new WordPress site: hand-selected themes, pre-installed plugins, and even a fully customized WordPress control panel. Their WordPress platform has been designed to increase load speeds by up to 2.5 times. They have also teamed up with SiteLock to deliver a deluxe security bundle, and included a custom firewall. 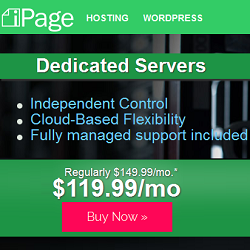 iPage offers two WordPress hosting plans WP Starter & WP Essentials. If you opt for 12 months term plan, then renewal charges are little bit higher than 36 months plan. WP Starter Plan is a basic package to get you started with core hosting plan, customized control panel and pre–installed themes & plugins. 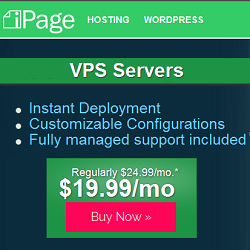 If you opt for 12 months WP Starter plan, your hosting renews @ $9.49/month and for 36 months, it renews @ $7.49/month. WP Essential plan is the ultimate solution for WordPress Hosting as you get additional benefit of WordPress expert support, Enhanced security and Super speed other than WP Starter Plan. If you opt for 12 months WP Essential plan, your hosting renews @ $12.49/month and for 36 month, it renews @ $10.49/month. iPage’s specially-trained support agents are experts in all things WordPress. You’ll be taken care of efficiently and effectively by helpful and knowledgeable individuals. We highly recommend you to buy WP Essential Plan because you will get Super speed, Enhanced security and the most important thing WordPress expert support.